The Destiny Laboratory after the astronauts go to sleep is a weird, creepy world straight out of science fiction. The dots on the hatch pointing to the docked Soyuz module in case the need for an emergency escape arises does nothing to ease the sense of impending doom. 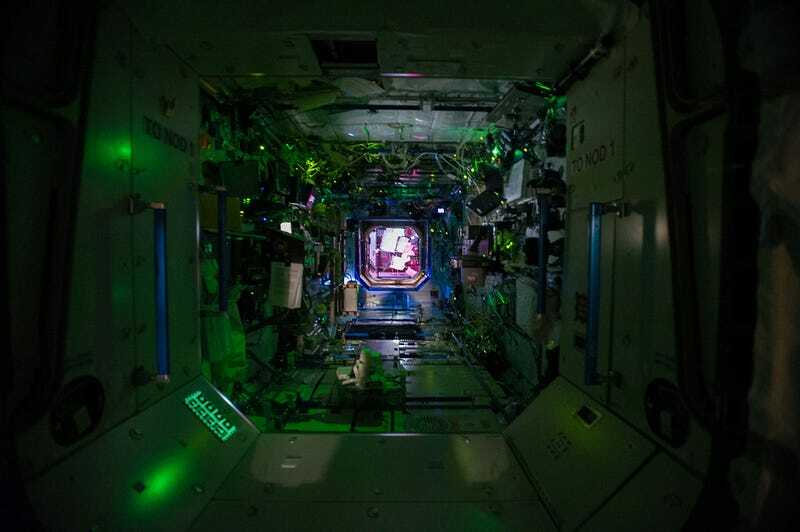 "Day" and "Night" on the space station are relative terms, not dictated by the sun but instead regularly-spaced artificial periods when the lights are flipped off and astronauts are supposed to be sleeping. But occasionally, they go prowling on a photography-spree instead, revealing a creepy world just waiting for a hostile alien to bust out, stalk our astronauts, and devour them in a grisly splatter of visual effects. The top photograph is taken from the Unity module, node 1, into the Destiny Laboratory, with the Harmony module, node 2, in the background. The green glow in the laboratory is the perfect setting for an alien to burst out, while bright purple light in the background is just eerie enough to make it clear this scene is literally out-of-this-world. I'm sorry, astronaut Alex, you're about to be eaten by a half-seen flurry of alien teeth, a dismembered limb pinwheeling past the escape hatch. The Unity module was the first American-supplied portion of the space station. With more than 50,000 mechanical items, 216 lines to carry fluids and gases, and 121 internal and external electrical cables using six miles of wire, it'd be a devastating location for an alien rampage. The Harmony module is a utility hub, connecting port, and passageway, providing essential life support systems like air, electrical, power, and water. It's also where the Canadarm is controlled, the giant robotic arm and last-hope for plucking an invader out of the station and flinging it away in space. Grow, my pretties! A pillow of vegetables grown in eerie purple light will only provide a brief respite from an alien's shrieks of hunger, but that respite may be all they need to escape. Nestled in between the two modules is the Destiny laboratory, the main focus of the photograph. The single porthole-window is ideal for providing a limited glimpse of some gangly creature crawling over the waffle-textured exterior of the cylinder, claws hooking into the tightly-woven debris shield blanket. The racks upon racks of experiments are a snackbar for a hungry alien: from captive mice squeaking in their enclosures to fresh produce in the new vegetable garden. The independent video feeds provide fleeting glimpses of alien limbs, claws, and teeth, tantalizing snippets enhancing the fear-factor prior to the big reveal. Is this life mimicking art, where sadistic engineers plotted how best to shape our space station into the set of a monster horror-movie, or is art mimicking life where photographs like this inspired the creation of the alien-stalking-humans-in-confined-isolation trope? Either way, I hope our astronauts can sleep tight knowing they're bait in a perfectly-lit set with integrated video feeds for the first-ever alien-attack reality show. Sweet dreams, Expedition 40! Because in space, no one can hear you scream.